Beautifully engraved unissued Certificate from the Hannibal Coca-Cola Bottling Company printed in the 1930's. This historic document has an ornate border around it with the Company's name in Bold Print. This hard to find Coca Cola certificate is over 60 years old. During the 1920's and 1930's Coca Cola had a system of utilizing independent companies throughout the United States for much of their bottling and distribution. The Hannibal Coca-Cola Bottling Company was one of them. The company's capitalization was for approximately $250,000 with a mix of Common and Preferred Stock. 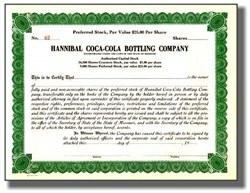 Coca Cola Stock certificates are extremely desirable and can be hard to find. We are also including a beautifully engraved EARLY check from the Coca Cola Bottling Company of Asheville, North Carolina issued in the 1930's as shown above. This historic document and has green border around it with a vignette of a hand hold a bottle of Coke. This item is hand signed and is over 67 years old. In 1886 Dr. John Stith Pemberton first introduces Coca-Cola in Atlanta, Georgia. The pharmacist concocted a caramel-colored syrup in a three-legged brass kettle in his backyard. He first "distributes" Coca-Cola by carrying it in a jug down the street to Jacobs' Pharmacy. For five cents, consumers can enjoy a glass of Coca-Cola at the soda fountain. This year, sales of Coca-Cola average nine drinks per day. In 1891 Atlanta entrepreneur Asa G. Candler acquires complete ownership of the Coca-Cola business for $2,300. Within four years, his merchandising flair helps expand consumption of Coca-Cola to every part of the nation. By 1914, Candler had acquired a fortune of some $50 million. Baseball hall of famer Ty Cobb, a Georgia native, was another early investor in the company. In 1893 The trademark "Coca-Cola" name and script are registered with the U.S. Patent and Trademark Office. 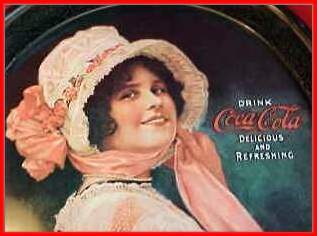 Dr. Pemberton's partner and bookkeeper, Frank M. Robinson, suggested the name and penned "Coca-Cola" in the unique flowing script that is famous worldwide today. Mr. Robinson thought "the two C's would look well in advertising." Coca-Cola" was first sold for 5� a glass as a soda fountain drink at Jacob's Pharmacy in Atlanta, Georgia. In 1894, Joseph A. Biedenharn, owner of the Biedenharn Candy Company in Vicksburg, Mississippi, first bottled "Coca Cola." By 1903, the use of cocaine was controversial and "Coca-Cola" decided to use only "spent coca leaves." It also stopped advertising "Coca-Cola" as a cure for headaches and other ills. In 1929, after his death, Griggs Candler's family sold the interest in "Coca-Cola" to a group of businessmen led by Ernest Woodruff for $25 million. Woodruff was appointed president of "Coca-Cola" on April 28, 1923 and stayed on the job until 1955. Hannibal (America's Hometown) is a city in Marion and Ralls County, Missouri. The population was 17,757 at the 2000 census. It is the boyhood home of Mark Twain and the model for the setting of his The Adventures of Tom Sawyer. Historical sites related to Mark Twain and sites depicted in his fiction have become an important part of the town's legacy. Hannibal was also the birthplace of singer and actor Cliff Edwards ("Ukelele Ike") and 'The Unsinkable Molly' Brown. Other native sons include inventor Bill Lear and NBA basketball coach Cotton Fitzsimmons. The Mississippi River at Hannibal, MissouriHannibal is located at 39�42′15″N, 91�22′39″W (39.704065, -91.377378)GR1. It is adjacent to the Mississippi River. According to the United States Census Bureau, the city has a total area of 39.1 km� (15.1 mi�). 37.8 km� (14.6 mi�) of it is land and 1.2 km� (0.5 mi�) of it (3.12%) is water. Demographics As of the censusGR2 of 2000, there were 17,757 people, 7,017 households, and 4,554 families residing in the city. The population density was 469.3/km� (1,215.3/mi�). There were 7,886 housing units at an average density of 208.4/km� (539.7/mi�). The racial makeup of the city was 90.61% White, 6.57% African American, 0.35% Native American, 0.35% Asian, 0.07% Pacific Islander, 0.25% from other races, and 1.79% from two or more races. Hispanic or Latino of any race were 1.13% of the population. There were 7,017 households out of which 32.5% had children under the age of 18 living with them, 48.0% were married couples living together, 13.6% had a female householder with no husband present, and 35.1% were non-families. 30.6% of all households were made up of individuals and 15.0% had someone living alone who was 65 years of age or older. The average household size was 2.40 and the average family size was 2.98. In the city the population was spread out with 25.8% under the age of 18, 10.5% from 18 to 24, 26.3% from 25 to 44, 20.6% from 45 to 64, and 16.8% who were 65 years of age or older. The median age was 36 years. For every 100 females there were 86.7 males. For every 100 females age 18 and over, there were 81.8 males. The median income for a household in the city was $29,892, and the median income for a family was $37,264. Males had a median income of $30,677 versus $20,828 for females. The per capita income for the city was $16,902. About 11.3% of families and 14.1% of the population were below the poverty line, including 18.2% of those under age 18 and 10.8% of those age 65 or over. Education Hannibal High School was founded in 1896. The current building was erected in 1932. As of 2004 the current enrollment is 1232 ninth through twelfth graders. The mascot of Hannibal High School is the Pirates and the athletic teams play in the North Central Missouri Conference of the Missouri State High School Sports Association. The "Black & Red" is one of America's oldest school newspaper. As of 2004 the principal is Darin Powell. Newspaper The Hannibal Courier-Post is Missouri's oldest newspaper. It began publishing in 1837 and has a current daily press of 12,000. Hannibal-LaGrange College Hannibal-LaGrange College is one of the premiere Christian liberal arts colleges in the state. Hannibal-LaGrange is a four-year liberal arts college fully accredited by the Higher Learning Commission and a member of the North Central Association of Colleges and Schools. Founded in 1858 in LaGrange, Missouri, the campus moved downriver to Hannibal in 1928. Dr. Woodrow Burt was elected the 16th president of Hannibal-LaGrange College on February 10, 1995. The College offers more than 30 majors and has a student population of 1,150. HLG is a member of the National Association of Intercollegiate Athletes (NAIA) Division I. HLG competes in five men's sports, including soccer, basketball, baseball, cross country, and golf, and five women's sports, including soccer, softball, basketball, volleyball, and cross country. History from the world's best encyclopedia and encyberpedia, Wikipedia.